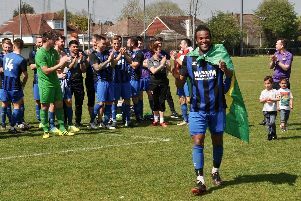 Tom Burton got the only goal as Shoreham Football Club kept their Southern Combination League Premier Division title hopes alive on Saturday. Burton’s effort on the hour helped Mussels to a 1-0 win over Pagham at Middle Road. Shoreham started the day in second - trailing league leaders Haywards Heath by a point - needing to avoid defeat to keep their title ambitions alive. Heath sealed a 3-1 home victory over Loxwood, meaning a loss for Mussels would have seen Shaun Saunders’ team crowned champions. Shoreham boss Bryan O’Toole was pleased with the clinical edge shown by his team on Saturday and said: “We’ve taken it down to the final day and that’s all I asked the players. “It still feels like we’ve thrown it away, even if we do win it I don’t think I’d have the same feeling as I would have done. “We were really good against Pagham, you can see why they are on a good run at the minute, but we minimised their threat. “It’s out of our hands and that is not what we wanted, all we can do going into this game is make sure we take all three points. Mussels were quick out of the blocks and could have been two up inside five minutes. Burton - who was handed a start after Rob O’Toole pulled out in the warm-up - headed over from close-range, he then fired wide when through on goal as it remained scoreless. Kevin Keehan’s fierce drive from the edge of the area was kept out by James Binfield in Pagham’s goal on the half-hour, before Joe Dryer flashed a strike wide. The decisive effort came on the hour as Burton slotted past Binfield. Shoreham pushed for a second in the closing stages but it ended 1-0. Mussels now must win at Arundel on the final day to have any hope of overhauling the one-point deficit between themselves and leaders Haywards Heath. Should Heath either lose or draw in their final game of the season at Horsham YMCA - a team that have beaten Shoreham twice this season - Mussels will be crowned champions. Mussels boss Bryan O’Toole just wants his side to control what they can. He added: “We just need to win our game and wait and see. It’s annoying and I take the blame myself for wasting the lead that we had. SHOREHAM: Heyburn; Hartley, O’Hagan, Pearson, Packer; J.Keehan, K.Keehan, Shelley; Burton, Pamment, Dryer. Subs: Donaldson (Burton), Laing (Donaldson), Caplin, Storrie, R.O’Toole.